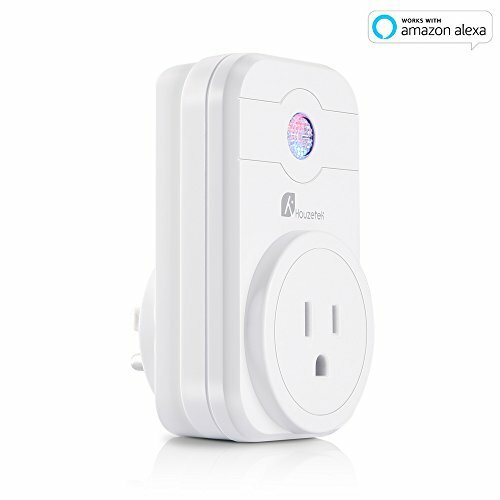 The Houzetek WiFi Smart Plug can be controlled by your smartphone APP to turn on /off the household appliances or set a timer for remote control while you are away from home. Houzetek Smart Plug allows you to create schedules to automatically power on or off your home electronics and appliances at anytime. You can create a schedule for each device any day of the week, or customize it by a specific time in a day. Keep energy bills low by effectively managing your most power consuming appliances. Scheduling allows you to prevent power hungry devices from being left on longer than needed.Make your devices run on your schedule, even when you're not there. Houzetek Smart Plug can be controlled through your existing Wi-Fi network via the App. Download the app to your smartphone or tablet and have access to turn your home devices on/off, set schedules, and monitor energy usage. The Free app allows you to add as many Smart Plugs as you'd like to keep track of multiple appliances, whenever, wherever. The Smart Plug works directly with Amazon Alexa to manage your devices through Voice Control. Assign a name to each Smart Plug and communicate each plug by name when making a voice command. Works with any Wi-Fi router without the need for a separate hub or paid subscription service.